It’s been one month since I joined Accenture as a Managing Director (last Friday, 1st) and the best word to describe the journey so far is excitement – lots of it! The company itself is huge but on my first line of sight I have 5 terrific organisations: Accenture Interactive, Accenture Analytics, Accenture Mobility, as well as Fjord and the most recent acquisition, Karmarama. That’s actually been almost a full time job – meeting people – the most important ingredient of a successful organisation. And it links in with the first mission I had for this first month – find an internal team that is willing to join in our mission. Support and accelerate Accenture’s cultural change – most challenges in our clients industries and organisations are provoked by digital and most of the solutions will have a strong component of it as well – the whole organisation needs to embrace it. There’s a lot of work but also a lot of incentive and enthusiasm! Plenty of whiteboards around but I still love my notebook! 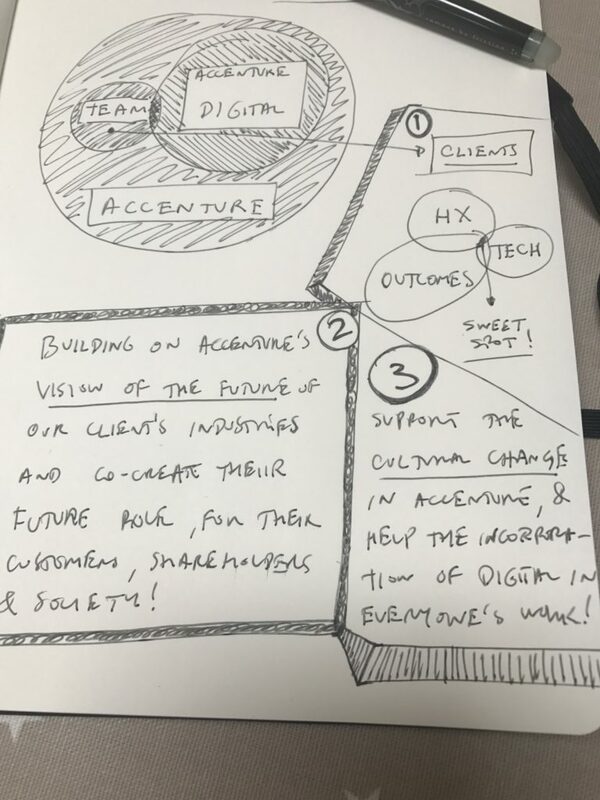 In short, we’re helping to build our bit of the future of Accenture in the UK – and I assume you understand, with this mandate, team and incentives, I am very excited! Want to grow and learn about the best practices, technology and from the best talent in the world, and are not afraid to fail for being too bold! The most fun part is about to begin as we start mapping what lateral plays and disruptive moves these industries have up their sleeves, and begin plotting the way they can take to get there. 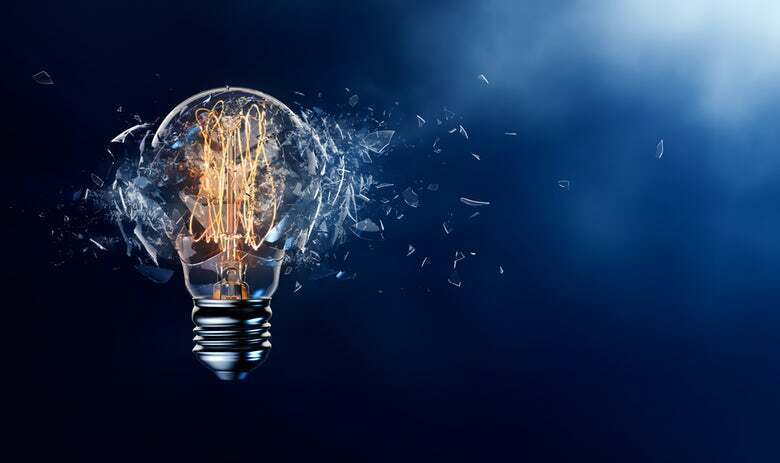 We already have a few ideas being developed to showcase (with our awesome Innovation teams), and will soon begin bringing the ecosystem of partners that can help us complement these disruptive moves. 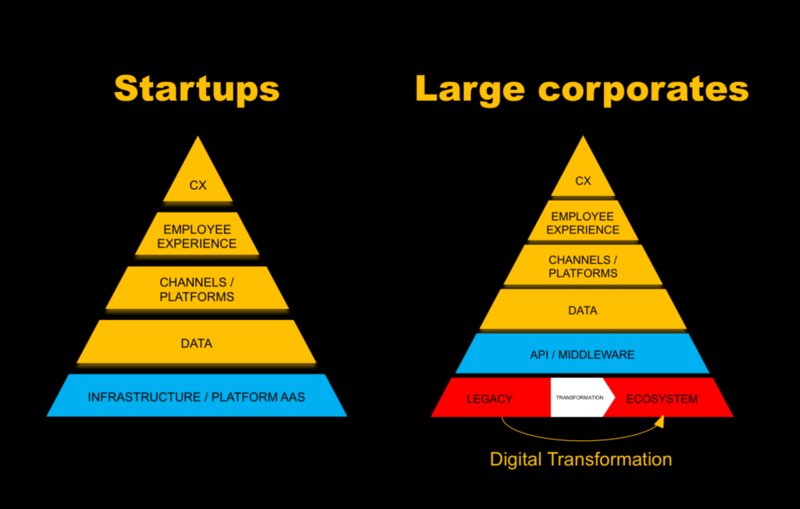 The core business is under threat but incumbents have a few things all startups and (most) challenger businesses don’t: Data and customers. Hopefully we’ll be able to work wonders with these, and eventually get one of these ventures off the ground in 12 months. We’ll touch base as soon as the real fun begins – workshops, resulting pitches and a few keynotes already in the pipeline. If you want to be a part of this adventure get in touch, there might be a role for you to play. Welcome to the future – and don’t be a stranger! Partnership on AI: What needs to come next! Thanks for a snapshot of your month, it was an interesting read. I’m a London based director at kazlouroche.com technology consultancy, working with founders and entrepreneurs on finding solutions to global challenges in health tech, transport and telecom. I too agree that the cultural change is going to be one key innovation factor. Ensuring that our digital livelihoods aren’t going to divert us towards further isolation and disconnect, the way we see the disconnect between the scientific and public view on the weather today is a great reminder to that. Ecosystem on which ever lever you desire to look at it has one quality of interconnectedness. Physical and mental well being and productivity, resources to hand, known and unexpected new challenges are all going to form the vision of the future. The future of work, education, health, our planet.